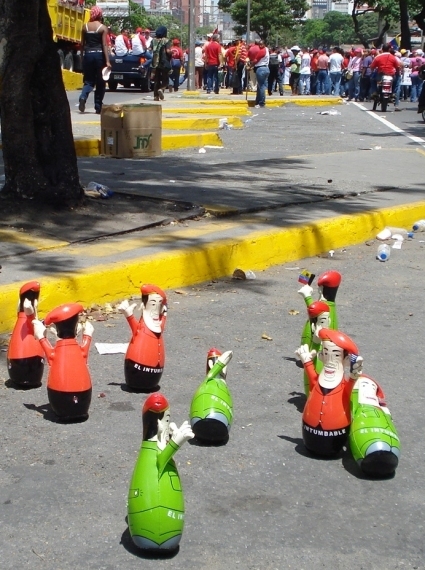 The Chavez party, PSUV is holding its primaries today. Should we consider it a sign of internal democracy and hope for a better future for us? Think again. 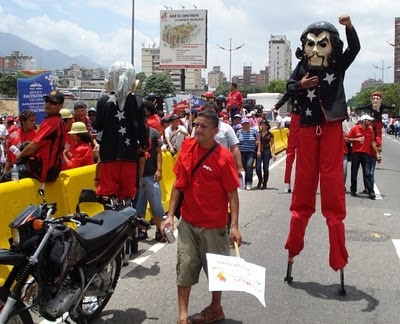 As a matter of fact this weekend we get two evidences that the PSUV is surely aligning itself with these totalitarian regimes central party where participation and democracy was announced all over the board but where instead reigned coercion and the single will of the top leader. And thus such central parties/PSUV became/become slowly but surely tools of segregation. The two examples are the primary elections today and the May first parade yesterday. 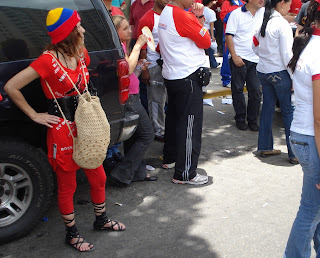 Let's start with the easy one to dispatch, the PSUV primary election. Nothing to look for in there. 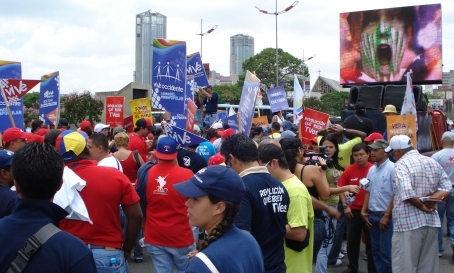 Contrary to the opposition primaries only PSUV members can participate. Not that it is wrong to limit your primaries to your voters, far from it, but it kills any attacks against the opposition primaries. Those ones might have been limited to a few districts but were open. The PSUV ones might be all over the country but that does not make them any more representative or democratic than the opposition ones. 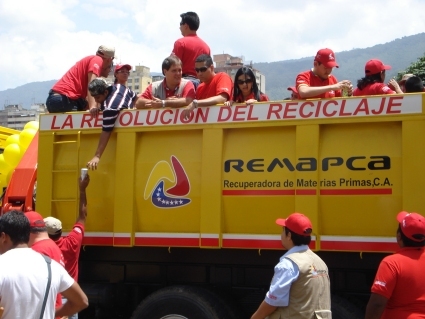 We learn about the PSUV machinery deployed to bring voters to the polling stations. Who pays for the buses used? Did the opposition use buses for its primaries to ferry people to vote? The voting rolls will not be destroyed while the opposition ones were. That is, the PSUV will know who voted and who did not and that will be used int he future to get jobs and other "benefits" from the revolution. Some PSUV people said it so though some others tried to make us believe it was not true. 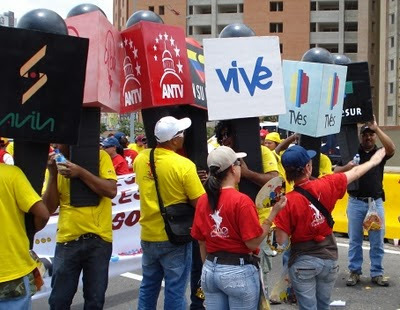 We are going to MAISANTA3.0 where the list, as predicted, is not used anymore to discriminate against opposition voters only, but to keep control of the PSUV crowd. And the names for the List Vote, 56 names, are reserved for Chavez to decide who gets the nod. At least in the opposition those names were decided by long discussions among several party, not great but certainly better than Chavez deciding on his own. So yes, it is true, it might still be better at the PSUV than Cuba's communist party, but barely. This report comes from my S.O. who works at a ministry that will remain nameless. That ministry changed head not that long ago and now once a week the staff must attend compulsory speeches where they are told about socialism and how nasty the IMF is. Never mind the inquiries as to whether people have joined the PSUV. But yesterday was the worst. My S.O. goes on occasion to some of the chavista marches and rallies, forced to of course, but leaving as early as possible once the appropriate salutations were done. Yesterday my S.O. boss was checking through the cell phones on people that were missing. People trying to leave where called back by the boss. 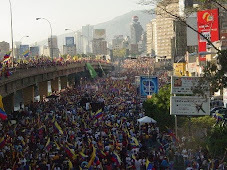 Now you know how attendance is managed at these red marches and how many of these people, chavistas or not, are forced to attend. The word "herding" comes to mind, no? Since my S.O was forced to stay through the whole ordeal there was nothing else but take pictures and enjoy the tacky show. A section of photos with my comments. Enjoy. 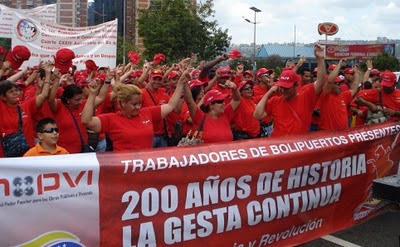 Public employees of Venezuela's Harbors "bolipuertos"! Even recycling trucks had to go and carry folks. Though one wonders if that truck saw its first can, I mean, besides the beer they are drinking and passing around. And there is the bolivarian media! The only one you well know is objective, impartial, open, offering sublime ideas and zero propaganda. Truly, a Che Guevara out of historical horror show!!! Or is it someone from planet of the apes? And perhaps the best one to finish: traditional "porfiado" dolls, the ones that never go side ways. All full of hot air at the image of the beloved micomandantepresidente, your choice of red or military. So your media naranja works at the ministry? Is she willing to plant a little gift in the ministry's computers? It doesn't need root/admin access. It can be Windows or Linux or even crapintosh. All we need is access to a computer inside the network. And if you know the email addresses of "interesting people", that might be useful too. El Nacional also has a great article on the Bolivarian militia. Do these people really believe a "yanqui" invasion is imminent? For how many years has Chavez been talking about the supposed invasion that never seems to come? Have no chavistas ever heard the fable about "crying wolf"? media naranja and myself are too ignorant of hackery to even contemplate such as scheme- though i understand that the computer servers are closely watched. we never exchange mails in day time and in fact i do not even know the work mail!!! nor i want to know it to avoid temptations even when i write from my personal mail. that is why SMS was invented. Of course they don't really believe a Yankee invasion is imminent. That is nothing but a distraction. All dictatorships need foreign distractions to keep their people from rioting over the food, power and water blackouts. These almost always happen in such cases. the chavistas in track pants are packing in their fanny packs.